Pittonkatonk is music without boundaries. Since 2014, Pittonkatonk is music in public spaces that belong to everyone, with no stage, no doors, and no right way to express yourself. There is no admission fee, no corporate sponsors, and nothing is for sale. It is a potluck event where people bring food, drink, music, dancing, and the desire to come together to celebrate what music and community really can be. We connect people with national and local musicians, activists, and educators in order to empower them to use their love of music to engage the world around them. Our mission is to promote music performance as a means of achieving positive personal, social, and political outcomes. To achieve this we create events that engender purposeful music making on a communal level, blurring the lines between performer and spectator, entertainment and activism. We work with adults and teens from Pittsburgh to create public performance opportunities designed to give a voice vulnerable people in our city. Our goal is create a musical space for everyone, regardless of age, race, gender, class, or religion. 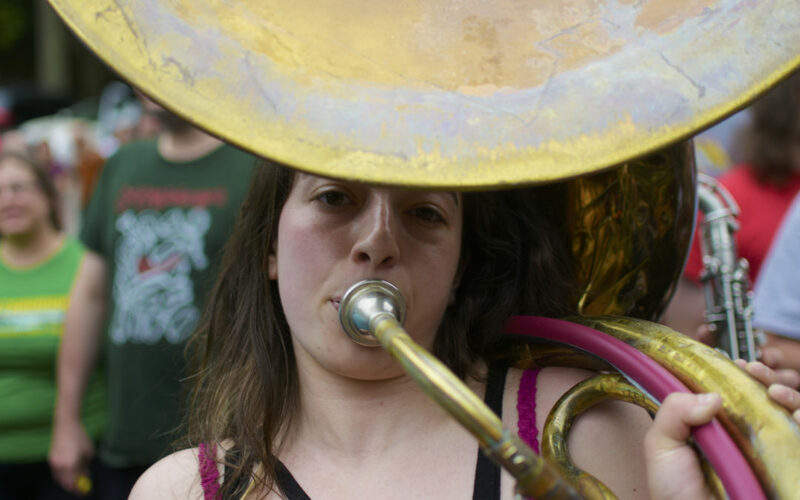 Pittonkatonk brings together bands ranging from Balkan brass to activist marching bands, samba to New Orleans swing. How about a house show for the whole city? How about a family reunion with 2000 people you’ve never met? How about a neighborhood party with 90 neighborhoods? That’s what we’re about. Pittonkatonk works because we make a call to action and, for the past three years, the community has answered. This year, we want to join forces with you again to make our city more inclusive, progressive, and welcoming. FREE AND OPEN TO ALL MAY DAY BRASS FESTIVAL BBQ at the VIETNAM VETERANS PAVILION in SCHENLEY PARK. Pittonkatonk 2016 had over 220 participating musicians & a crowd of over 3500 people. Just because there is no ticket price doesn’t mean we don’t need your support. Your monetary, potluck, and volunteer contributions will help create a festival unlike anything else in the city of Pittsburgh. What do we need? We need your help getting the word out, collecting donations, helping us bring together a gathering of folks from all over the city. So share our event page, flier, and indiegogo.